How did Menelaus Zannis Negroponte (1838-1893), by all accounts a simple Constantinople merchant, become embroiled in a British political imbroglio – a media circus, wild accusations, a libel case – involving the esteemed politician William Ewert Gladstone (1809-1898)? It started with correspondence between the two gentlemen. 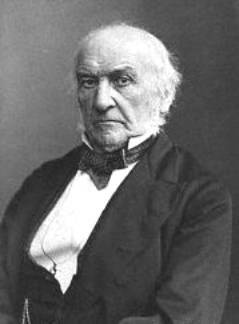 One assumes that Mr. Gladstone (pictured below), a rather busy politician, did not initiate the exchange. At the time Gladstone was out of office. Although still a Member of the House, he had lost the job of Prime Minister 17 Feb 1874 (ending the first of four tenures) and was not to return to the position until 28 Apr 1880, both times sandwiched in by Benjamin Disraeli [Lord Beaconsfield], his Conservative nemesis. Although it may be fair to call Gladstone the de facto Opposition leader, he was not, in fact, the actual leader of the British Liberal Party; he was somewhat of a free political spirit, rarely reluctant to express his views. It was in 1876, for example, that he published a pamphlet in which he attacked the Disraeli government for its indifference to the violent repression of the Bulgarian rebellion in the Ottoman Empire (see his wiki biography). The original piece of correspondence from Negroponte to Gladstone may well be found in one of the several archives that houses the latter’s papers; although often referred to, it never appeared publicly in its original form, so we have only comments from its author, various readers and some in the press who have endowed the letter with a life of its own. Gladstone’s reply—after the press had discussed the original letter, sight unseen, for a week—eventually did appear. ...whatever Mr. Gladstone's real opinion may be as to the wisdom or unwisdom of Greek interference in the present struggle [Turkey vs. Russia] he continues to give almost daily public proof that his bitterness against the Turk is tempered by no sweetness. Writing the other day on the subject of English sympathy with Turkey he says: "The conduct in this matter of many persons of superior Christianity, and in particular of the majority of the clergy, as contrasted with that of the Nonconformists, will to my dying day be to me a subject of great grief and astonishment." To another correspondent who had surmised that three-fourths of the people of London are "madly in favour of the Turk and wildly denunciatory of the Russian," he says by way of accounting for the fact: "The people of London, from deficient local institutions, have had less of political education than those of he country generally; and it is in London, too, that the evil influence of the money power is concentrated." In late 19th Century Britain both British-born Greeks and the Crown’s native Greek naturalized subjects were politically active, free-market and center-left by the standards of the day. They would have favored Gladstone. Bloodline Agelastos were in this group. For example, we were represented in the Greek residents of Liverpool who met with Sir Charles Kilke to discuss British-Greek foreign affairs at the Reform Club, June 1879 (Liverpool Mercury 6 Jun 1879). We were in a delegation that met with Lord Derby of the Foreign Office to discuss the British role in and the threat to Greek merchants' interests due to strife between Greece and Turkey (The Daily News [London], 6 Feb 1878). Almost a dozen years after the events sparked by Negroponte’s letter, John Michael Agelasto and one of his daughters attended a reception at the National Liberal Club, 2 May 1888, to honor GOM (the Grand Old Man) at the opening of the Gladstone Library (Daily News [London] 4 May 1888). And, two years before Gladstone died, on a visit to Liverpool, he gave an hour and a quarter speech—his last major political speech—under the auspices of the city’s Reform Club, haranguing the Turks on human rights (to wild cheers according to the reporter) and coming precipitously close to calling for war (New York Times, 29 Sep 1896). Thus appears the first mention of Mr. Negroponte’s full name sufficient enough for us to identify him on our family tree. It took another week and, indeed, Negroponte’s letter to the editor showed up in The Times, under the heading “Mr. Gladstone and the Greeks”. This well-written epistle (see insert below) comes from a man who professes “an imperfect knowledge of the English language”. Negroponte obviously had help with composing the letter; perhaps someone wrote the whole thing for him. It is odd that he fails to explain exactly the content of his initial letter, the one that evoked Gladstone’s response (Well, it’s not odd if someone else wrote the letter for him and that person did not know the content of his first correspondence). Or someone could have put him up to the entire letter-writing episode, a conjecture in retrospect that seems highly likely. In fact, it seems a bit extraordinary that a Turkish national, an ethnic Greek, a merchant minding his own business in a potentially hostile environment, would choose to write the former Prime Minister of England, the de facto Opposition leader, a man known to be sympathetic to the cause of Greek independence. In any case, such a letter was apparently written. Negroponte chooses to complain about The Daily Telegraph to The Times, a newspaper with considerably lower circulation. Perhaps he was afraid the offending journal would not publish his grievance. Or maybe some invisible hand suggested sending his clarification to a more liberally inclined publication. The Daily Telegraph, founded in 1855 and a Fleet Street broadside from 1880, had at one time, itself, been liberal but recently had turned conservative. The original editor, Thornton Leigh Hunt, supported Gladstone and even called him the ‘People's William.’ But after Hunt's death in 1873 the new editor, Edwin Arnold, ran a paper that “favoured the more imperialistic policies of his Conservative opponent, Benjamin Disraeli,” according to a British scholastic website. In modern times the paper has remained politically conservative, but the Daily Telegraph's role in the Negroponte affair suggests something more: sloppy or irresponsible journalism at best or blatant anti-Gladstone bias at worse. Its modern day counterpart might be the New York Post or Fox News in the United States. Negroponte’s letter to The Times was copied in its entirety in The Pall Mall Gazette, 15 Sep 1877, and the Aberdeen Weekly Journal, 17 Sep 1877. In his letter Negroponte refers to his English-language helpers, who apparently betrayed him and shared his letter with the Daily Telegraph. “Out of delicacy” he did not mention the man’s name. In his last paragraph he maintains that all Greeks share with him a ‘strict neutrality’ in the Russo-Turkish war. One can imagine Greeks in London, Liverpool, Manchester and elsewhere in the United Kingdom having a chuckle over this, speculating just how deep a problem Negroponte had gotten himself into and wondering if these words would successfully calm whichever Turks he may have offended. Short of having a gun to his head, this is not the sort of writing one would expect to come from a man whose parents had lived on the island of Chios at the time of the 1822 massacre and were forced to flee their homeland the decade before his birth. Examining the logic underlying people’s motivations, one may look at each of the actors involved in this affair. First, ask how a politician of Mr. Gladstone’s reputation, background—a native Liverpudlian, the son of a wealth sugar merchant—and political skill could get himself into trouble like this. The simple answer is that the controversy arrived on his doorstep, that he didn’t create it but, rather, that every step of the way he was merely responding. This attack-response-attack-response will continue to hold true until the end of the Negroponte affair. Second, Mr. Negroponte. The description above—“a ‘crummy’ corn merchant, of conservative tendencies, and with a correct taste in cereals”—while not flattering does suggest he’s non-political (as would be expected of a merchant) and places him outside any group of political firebrands clamoring for war with Turkey. He is described by the Telegraph as simply a merchant, who had some concerns and wrote a British politician. This picture supports how we picture the author of the well-articulated Times letter. The author of that letter (be it Mr. Negroponte or a ghost-writer) is offended that someone stole his letter and used it as part of their anti-Gladstone agenda. Third, the newspaper. As an actor, the Daily Telegraph initiated the controversy. Its bias is transparent. The letter contains at least one factual error as it hints that Gladstone started the correspondence with Negroponte. The Daily Telegraph piece lacks specifics. It exaggerates (implies that knowledge of the letters was widespread, which is unlikely, an assertion never subsequently supported; strongly suggests that Gladstone’s policies could escalate Greece into war, which never happened). The article fails to quote from the alleged correspondence, which could suggest the ‘special correspondent’ never even saw the letters, but is rather basing his entire report on hearsay. We don’t know the identity of the correspondent; it may not be a journalist but rather a person with an ax to grind. The article begins with a superlative and uses hard-hitting words of agitation—‘most important’, ‘stir up’, ‘interference’, ‘deprecate’, ‘crush’, ‘anxious’, ‘disturb’ and ‘destruction.’ It reads less like journalism (as we imagine it in its perfection) and more like political posturing. After the newspaper noted Gladstone’s initial denials it replied that “‘our Correspondent withdraws the statement which circumstances oblige him to leave unproven by documents,’ thus hinting that documents to prove it did exist” (P.W. Clayden, England under Lord Beaconsfield, pg. 456 (1880, repr 1971, internet archive 2009). The fourth actor, who fed the story to the newspaper, is discussed next. has neither time nor leisure to enter into a discussion with Mr. Gladstone. The respectability and high position of our information are beyond doubt. He has calumniated no one, nor shown any animosity on questions of the greatest importance. We believe, therefore, that the information which he has given us is perfectly trustworthy. We published it as such. None of our readers have any doubt of the truth of what we advanced... We are ready to publish the documents in question as soon as our informant furnishes us with a copy. The remainder of the Times article is in French, a submission by the Telegraph correspondent, which the Times reporter concedes is “needlessly long, and, for the most part, wide of the mark” but nonetheless the paper reproduces it. It includes some paragraphs abstracted from a Turkish newspaper, Le Vakit (30 Oct 1877) (its successor today is the eponymous conservative Islamic daily), which is largely based on the original Telegraph dispatch. It adds only that Gladstone has denied corresponding with Negroponte [a false statement; Gladstone admitted the correspondence from the start], whom they call an “honest Oriental who would not lie about something that exists,” and that Negroponte admits initiating the correspondence. The article condemns Gladstone as being anti-Turk with the various accusations capsulized in the Telegraph piece. The alleged Polonius was exposed in The Times (11 Feb 1878, pg. 6), under the heading "Mr. Gladstone and Mr. Layard," with the publishing in Parliament of correspondence dated 29 Oct 1877 from Austen Henry Layard (photo below), British Ambassador (1877-80) to the Ottoman Empire, to the Foreign Secretary, the Earl of Derby. Mr. Layard describes the extent to which he was involved in the affair. He contends that Negroponte had well known “sympathies and connexion (sic) with the revolutionary committees in Greece” and had come to him, Layard, in August 1877 to argue the case for “a general rising of the Greek population of Turkey against the Turkish rule” and ask for Britain’s help. In their discussion (Layard expressed the Government’s position on Turkey, which can in hindsight be perhaps described as somewhere between pro-Turkey ‘neutrality,’ or one of accommodation to avoid confrontation) Negroponte referred to a letter from Gladstone inciting Greeks against Turks, according to Layard. Later, on 5 Sep 1877 Negroponte gave Layard, he said, a treatise expanding on his ideas [this document never became public]. The Ambassador mentions a letter in The Pall Mall Gazette, 15 Sep 1877, written by “a well-known publicist” in Constantinople who had been informed by Negroponte of his correspondence with Gladstone but had not been shown the letters [the name of this person never was revealed]. (The Pall Mall Gazette of that date contained a copy of Negroponte's letter to The Times; this is perhaps what Layard was referring to). Layard also reveals that The Times correspondent on 20 Aug 1877 showed him a letter from Gladstone to Negroponte, in English, saying that “as M. Negroponte was not inclined to take his (Mr. Gladstone’s) advise that the Greeks should throw their lot in with the Slavs, he had none other to give.” The correspondence now being public, Layard says, the Daily Telegraph correspondent “took time to inquire into the matter, and having satisfied himself that a correspondence was going on between Mr. Gladstone and M. Negroponte, and that the Greeks were under the impression that Mr. Gladstone had been stirring them up to unite with the Slavs to attack the Turks,” and he wrote the article. Layard calls Negroponte’s letter to The Times “a tissue of falsehoods from almost the first word to the last.” He comments on the existence of various letters between Gladstone and Negroponte, in different languages, and suggests they all be made public. Finally, he lays on Negroponte the blame for the misunderstanding, to wit, that he, Layard, has been “misrepresenting and calumniating a distinguished statesman [i.e., Gladstone] for whom I cannot but have the highest esteem and respect." Who is to be believed, Negroponte or Layard? As pointed out in his Wikipedia biography, “Layard's political life was somewhat stormy. His manner was brusque, and his advocacy of the causes which he had at heart, though always perfectly sincere, was vehement to the point sometimes of recklessness.” Was this an instance of such recklessness, or disregard for the truth? Gladstone’s response to Layard’s points appears in the same Parliamentary Proceeding but adds little amplification. He remains above the Negroponte vs. Layard scrum (although it is a bit of a rout, with Negroponte nowhere in sight and unable to fight back), explaining the brevity of his correspondence with the Greek, correcting a few of Layard’s ‘facts,’ and insisting that the media and Mr. Layard are misunderstanding what he had written, not having seen the initial correspondence. He appears quite transparent, not overly perturbed and, indeed, above the fray. In sum, an extremely polished politician. And patient. To a point. The Proceedings include Gladstone’s continuing request, over several months, for Layard’s response and a final letter, dated 28 Jan 1878, by which time he had lost patience, and was perturbed that Layard had “transmitted to the anonymous irresponsible correspondent of a London journal an injurious accusation against me...without, however, any indication of the source from which it had come”. So, in addition to Negroponte vs. Layard, we now have Gladstone vs. Layard. And unlike Negroponte, Gladstone is not one to vanish from a fight. At this time several British newspapers began covering this story. Aberdeen Weekly Journal (11 Feb 1878) reproduced the Parliamentary Proceedings verbatim, as had The Times, while The Liverpool Mercury of the same day and The Bristol Mercury and Daily Post (12/16 Feb 1878) summarized it, the latter publication an identical article on two separate days. After the most bare summary of events The Hampshire Telegraph and Sussex Chronicle (13 Feb 1878) editorialized that “Mr. Layard’s roundabout attack on Mr. Gladstone [showed] what a reckless transmitter of intelligence Mr. Layard is…neither the Telegraph, nor its correspondent, nor Mr. Layard, all of whom have been guilty of conduct of the most reprehensible kind, has yet made the amende for these calumnious statements. Mr. Layard, indeed, strives to scramble out of the difficulty by stigmatising M. Negroponte as a liar, but even were this the case, it does not clear our Ambassador from the charge of having acted with the grossest indiscretion...” In a less harsh manner The Manchester Times (16 Feb 1878) also sided with Gladstone. A London weekly characterized Layard as a bully, who has “been branded by the first of English statesmen [Gladstone] as an untruthful person in face of Europe, and that on evidence which is apparently too substantial to be ignored” (The Examiner, 16 Feb 1878). The House of Commons on 12 Mar 1878 took up a motion put forth by Evelyn Ashley, a Liberal, that the House “views with regret the part taken in the matter by her majesty's Ambassador,” a censure of Layard that would have forced his resignation, further embarrassed the Disraeli government and perhaps caused it to fall (it hung on for another two years). At this time the Foreign Office also presented a letter from Layard, dated 29 Feb 1878, in which he denies Gladstone’s accusations of 28 Jan 1878 and presents an apology of sorts: "All that I have to answer for is that I may perhaps indiscreetly have called the attention of a newspaper correspondent to a letter which was already public property." He added that since Gladstone's second letter to Negroponte, dated 21 July 1878, had now become public—after Gladstone had found it in his files and given it to The Times—Layard could say that “it would appear that M. Negroponte has been guilty of a further deliberate misstatement of facts, and I have no hesitation in expressing my regret to Mr. Gladstone that I have been the victim of it” (Aberdeen Weekly Journal (13 Mar 1878), The Times (13 Mar 1878, pg. 11), The Manchester Times (16 Mar 1878), The Leeds Mercury (13 Mar 1878), The Newcastle Courant (15 March 1878). The press covered the censure vote variously by: reproducing what appears to be either wire-service or official reportage (Liverpool Mercury [13 March 1878], Aberdeen Weekly Journal [March 13, 1878]); brief summary (The Hull Packet and East Riding Times [March 15, 1878]; Jackson's Oxford Journal [March 16, 1878]); editorial comment (Hampshire Telegraph and Sussex Chronicle [16 Mar 1878]); Trewman's Exeter Flying Post [20 Mar 1878]; The Graphic [16 Mar 1878]; The Examiner [16 Mar 1878]); or a mixture of reportage and comment (The Bristol Mercury and Daily Post [March 13, 1878]). The Ipswich Journal [16 March 1878] copied its article from the conservative, pro-Tory Pall Mall Gazette, and the Pall Mall Gazette (16 Mar 1878), in turn, gave several inches to the opinions of Saturday Review and Spectator, opinions it disagreed with and thus criticized. The vote on censure went along party lines; the Conservatives, the party in power, prevented the Ambassador’s censure. Thus, the House defeated the motion by 74 votes, 206-132 and then retired at 1:20 a.m. after almost seven hours of debate. Gladstone had left the session immediately before debate began. There is nothing extravagantly eulogistic at one time in describing the House of Commons as ‘the first assembly of gentlemen in Europe.’ Perhaps it is still entitled to this proud designation, but it is certain that it not unfrequently does a good deal which is calculated to imperil it. The Pall Mall Gazette, in the Tory anti-Gladstone (meaning they must support Layard) press camp, came to the Ambassador’s defense saying his conduct [i.e., leaking to the press or vilifying the opposition, it’s not clear which] was the “sort of indiscretion which is committed by Ambassadors and Ministers somewhere in the world every day” and the paper was not alarmed with his sharing the Gladstone letter, “in a certain sense public property,” with The Telegraph. It called Negroponte “a member of the Greek Revolutionary Committee.” Layard’s sins were those of omission, not commission, and he should not be blamed for irresponsible journalism. As regards Gladstone the paper said they “found nothing very surprising in the statement that [he] had been encouraging the Greeks to take part in a ‘war of liberation.’” They echoed Layard’s complaint that Gladstone had released the wrong letter to the press [more a technical detail, without consequence]; it might not have been Gladstone’s stated intention to foment the Greeks, but it was clearly the expected result of the correspondence, they said [which, of course, proved false, as a war between Greece and Turkey did not arrive imminently]. Anybody with a moderate knowledge of political life might have seen that, on the face of it, the telegram was a mere canard, probably inserted in a moment of inadvertence. The reporter might, with equal certainty of making himself ridiculous, have assured the world that he knew Mr. Gladstone was writing letters to M. Henri de Rochefort strongly urging him to murder Marshal MacMahon. sulky apology, which rests on nothing except a transference of all blame from his own shoulders to those of a poor young newspaper agent whose account of the matter we are asked by Mr. Layard to consider utterly and wholly untrue...Had [the reporter] been an experienced politician, of course he would have put less confidence in Mr. Layard's power of accurate statement, and he would also have had sense enough to see that the whole story told him by Mr. Layard’s agent must be a grotesque hoax or a malicious fable…In a word, Mr. Layard tries to sneak out of the nasty scrape by attempting to fling all the blame on the poor reporter, whose only fault has been that he believed the word of an English Ambassador...How, in face of the story as told by himself, can Mr. Layard be regarded as a fit person to represent the Queen of England at a foreign Court? We would rather see the reporter he humbugged put in his place. The Graphic (16 Mar 1878) in a short piece, disparaged Layard's behavior but, with regard to censure, said that the penalty did not fit the crime. It also advised statesman to distance themselves from journalists. The episode was often viewed with humor. Indeed, some of the press (the Liberal press, that is) had difficulty reporting the censure debate with a straight face. They were especially harsh on Layard, who was characterized, sometimes lampooned, as inept, somewhat of a buffoon or an imbecile. The Greeks, even the most learned Greeks, cannot read our Greek writing, and we cannot make head or tail of theirs. Mr. Gladstone is one of the most skillful and accomplished of our Greek scholars...but when [he] got into correspondence with M. Negroponte, the right hon. gentleman could not spell out a word of the Greek's letter, and the Greek could not make anything out of Mr. Gladstone's Greek. They both had to pass on the letters to an interpreter. The furor around Negroponte in 1877-78 was extinguished almost as swiftly as it had been ignited. 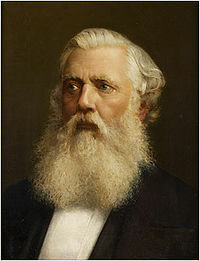 Layard remained Ambassador to Constantinople until the Disraeli Conservatives were replaced by the Gladstone Liberals in 1881. He then retired to pursue his interests in art and archaeology. But on the sidelines, away from the corridors of power, another battle, where the Negroponte affair would resurface, was brewing. This fight involved two men, who had once literally come to blows and now were taking their literary brawl into the courtroom. You and I may congratulate ourselves on having arrived nearly at the conclusion of this case, which has lasted a considerable time; and though I will not say that the time has been entirely wasted, as issues have been raised in some sense important, and the names of some distinguished persons have been mentioned with reference to important subjects, I cannot help thinking that at least you will be of opinion that a great deal of this time might have been spared, and that much of the importance of the case exists rather in the minds of the parties than in anything that concerns the public very much on one side or the other. Mr. Labouchere.—Well, Mr. Gladstone, you received no further apology nor any further "frank explanations." Mr. Gladstone.—None, either "frank" or otherwise. Whether The Telegraph’s publisher had been a responsible journalist was central to the libel charge. Both parties hoped that the Negroponte affair would address journalistic responsibility. Lawson had given Gladstone an opportunity to deny the report before it was published and at that time Gladstone’s comment, in which he referred to his other writings, was interpreted by the publisher as NOT an absolute denial. Gladstone’s testimony, consistent with his continual denial since publication, did not shed much more light onto the matter. It seems possible that when first asked, Gladstone did not even remember the Negroponte letter and thus would not have been able to confirm or deny it without further investigation. Eventually, the newspaper gave an apology to Gladstone for publishing allegations for which it lacked documentary proof. Whether this apology was sufficient for any harm the article did (did it do any?) can also be disputed. In any case the jury could not reach a verdict in the libel case. In other words the jury refused to accept the accusation of libel, but obviously lacked sufficient votes to clear the defendant by issuing a verdict of not guilty. The matter was not retried. Several weeks later Gladstone was again Prime Minister. The situation with Menelaus Zannis Negroponte, who was to live another decade, remains unknown.